Owing to our reputation in the industry for optimum quality, we are involved in offering a wide range of Glass Chandelier to our valuable clients. These are widely used for decor of interior. The offered Italian chandelier is made of high grade raw material. We are offering these in a wide range of Italian chandelier to allow maximum light transmission. 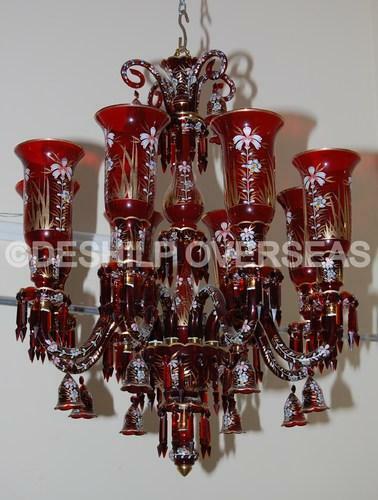 Apart from this, we are offering these Italian chandeliers at very reasonable prices to our valued customers. Packaging Details EXPORT PACKAGING WITH 6 SIDES THERMOCOL SINGLE PCS PACKAGING. Deshilp Overseas, began its establishment in the year 2015, as one of the leading manufacturers, exporter, wholesaler, retailers and suppliers of this commendable range of Decorative Glass Light. Our product range is Glass Chandeliers, Modern Ceiling Light and Glass Ceiling Lamp. Manufacturing of this array are done as per the set industry norms and guidelines, appropriating the excellent raw materials and latest machines. This ensures the product’s strength, quality and finishing. In addition to this, the offered range incorporating the finest Decorative Glass Items is marked at the most reasonable rate possible. Our highly precocious state-of-the-art infrastructural facility, strapped with all the important machinery and equipment, help us in the attainment of several of the firm’s predefined purposes and objectives. The facility separated into a number of highly operational units, help us in the maximization of the firm’s production capacity. In addition to this, the facility regularly upgraded, helps us in the maximization of our reach and boosting of our productivity. The huge client base from places such as Japan, Argentina, South America, Brazil, USA, Italy, France, Belgium, Poland, Sri Lanka, Thailand, Malaysia, Singapore, Australia, Norway and Gulf Countries is due to our ethical work practices.